Every road you drive has hazards. Potholes, poor lighting, dangerous debris, and other cars are among the more common roadway hazards that drivers encounter. And then there are the unforeseen hazards, such as deer or other animals that come out of nowhere, darting across the road, or worse, freezing directly in your path. According to statistics from the National Highway Traffic Safety Administration (NHTSA), car and deer crashes in the U.S. cause 150 deaths and $1.1 billion in damages each year. Those are pretty startling numbers, considering that they don’t include all of the crashes caused by drivers swerving to avoid hitting all those smaller animals that frequently skitter across the nation’s roads. In the interest of keeping you and other drivers from becoming a part of the above statistics, here are 5 tips to help you avoid hitting deer or other animals on the highway. While driving, when you see a “Deer Crossing” sign, it’s a good time to be extra alert and slow down. After all, that sign was put there for a reason–namely that there is higher deer traffic on that stretch of highway. Remember, if you spot a deer there are likely to be more nearby, so be extra cautious, especially when coming around blind curves. Taking warning signs seriously is a smart way to keep both you and the deer safe on the highway. If you live in or are traveling through an area with a known deer or other large animal population, you need to be aware of the peak times when these animals are moving about. The hours around sunset and sunrise are times when deer seem to move the most. And since the dimmer light of dawn and dusk makes it more difficult for drivers to see objects clearly, extra caution should be taken when driving during these hours. At night, on roads where oncoming traffic is infrequent, it’s best to use your high beams to better illuminate the area you’re traveling through. It’s also advisable to slow down, as this will give you more time to react should a deer suddenly appear. To further increase visibility at night, keep your windshield as clean as you can. To give yourself extra room should a deer dart out, keep your car as close to the center of the road as you safely and legally can. Finally, watch up ahead for any signs, such as reflective eyes, that a deer might be in or approaching the road. 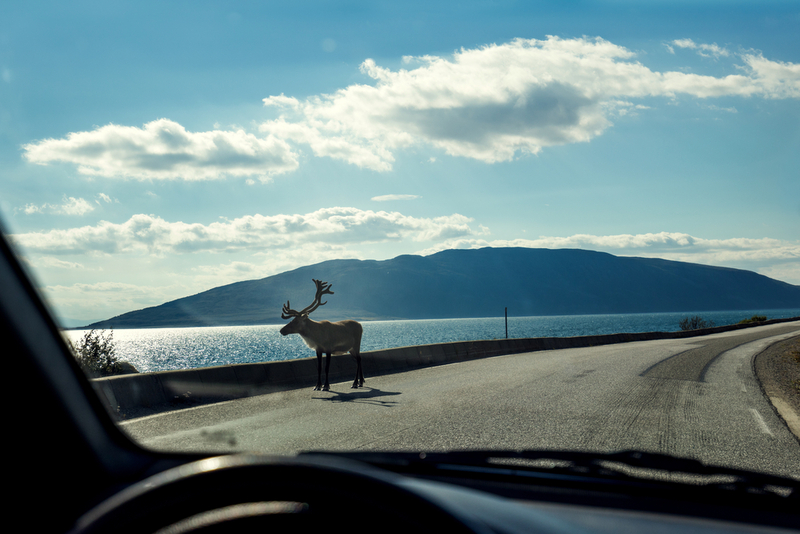 Just as you would when approaching a dangerous situation involving another car or cars on the road, you should drive defensively and take evasive action to avoid a deer on the road. Aside from always wearing your seatbelt, the first thing to do is to apply your brakes without slamming on them, as this could cause you to skid out of control. Once you’ve slowed down or come to a stop and no other cars are close by, honk your horn either long and loud, or in short bursts to frighten the animal away. This tip applies to deer and any other animals you might suddenly encounter on the roadway, including those cute little rabbits and squirrels. While no one wants to kill an animal with their car, swerving out of your lane to avoid hitting an animal could put you, your passengers, and other drivers on the road in mortal danger should your actions result in a collision with another car. While many people who live and drive in deer inhabited areas may never have a close call with a deer on the road, deadly deer encounters do happen. By following these tips you’ll be better prepared to make the best out of a potentially tragic situation, should a deer or any animal suddenly appear in front of your car.